Helen Sloan Daniels, now deceased archeologist, anthropologist, and historian from Durango, Colorado, wrote The Ute Indians of Southwestern Colorado in 1941 as a project for the Durango Public Library. It was one of the first, if not the first, popular books written on the Ute Indian culture. Unfortunately, Helen had to mimeograph the book, but she ended up using a four color memo process and even made elaborate drawings of Ute artifacts on mimeograph paper. The result, however, was a hard to read (in some places, impossible to read) book that soon became very rare and was not widely distributed. Helen Sloan Daniels cared for the Native Americans of her time, and especially the Ute Indians. This little book was painstakingly put together as a result, but it also fulfilled Helen’s constant goal to make her knowledge (and that of all authors) available to others through books. Jan and P. David Smith have edited and retyped the book making it available to the general public. It is an interesting (and sometimes shocking) book, not only about the Ute culture, but also about the way this tribe was viewed by local whites in the 1930s and 1940s. Daniels also includes quite a bit of material about the Utes from the 1880s and 1890s. And, the book shows the split in white attitudes towards Native Americans in general during both timeframes. Much of the information in this book cannot be found elsewhere. 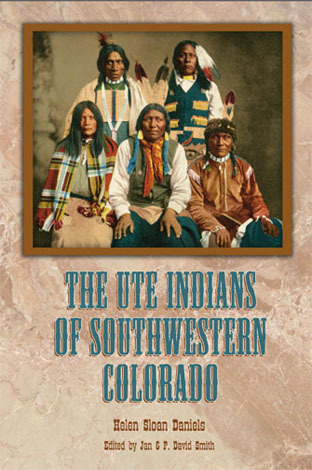 The Utes of Southwestern Colorado is a must read book for anyone who is interested in Ute culture, history, or artifacts.